Money Market Tips: STOCK MARKET--Why do we recommend THIRUMALAI CHEMICALS as one of our multibaggers? Recently, the stock price of Thirumalai Chemicals corrected by about 30 per cent from 52-week high of ₹2,440 despite reporting good set of numbers in the recent quarters. Thirumalai Chemicals is the second largest player in the domestic Phthalic anhydride (PAN) industry with market share of over 40 per cent after IG Petrochemicals. Thirumalai Chemicals has lined up PAN capacity expansion of 60,000 MT at Dahej, with first phase to be completed during FY19E. With second largest player in the domestic PAN industry with market share of over 40 per cent, raw material used for manufacturing PAN fell at a sharper rate, increase in domestic PAN demand, capacity expansion to cater growing demand of PAN in India, expanded food ingredients and fine chemicals capacity by 40 per cent and Malaysian subsidiary is likely to report strong earnings, we value Thirumalai Chemicals at 24.20x FY19E EPS of ₹91.6 to arrive at target price of ₹2,214, an upside of about 24 per cent. Key risks: a ) Major product of Thirumalai Chemicals such as PAN and aleic Anhydride are dependent on user industry, any slowdown in user industry will put pressure on profitability of the company. 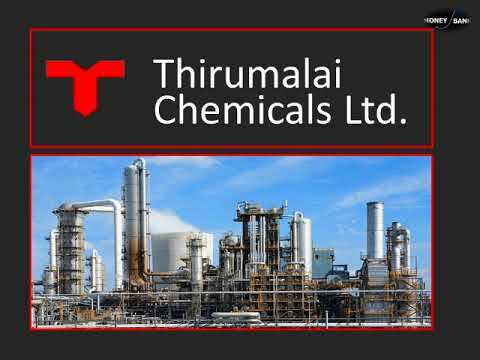 b) As Thirumalai Chemicals imports some part of its raw material, any negative price fluctuation or sourcing problem may impact business growth of the company. c) Any negative fluctuation of rupee against major currency may adversely impact margin of Thirumalai Chemicals.